Earlier this month, I posted "Japanese Lunch Specials in LA." 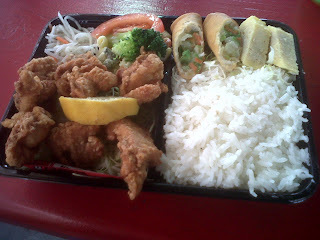 One of the specials that I liked was from Bento Man on Western, just South of Pico, in LA. I said that I could get something similar at an Asian market for $6.99. Just happened to be looking for some noodles for a client to try and came across this Karaage (Japanese fried chicken) Bento for $6.99 at a major Japanese market in LA. You get 4 pieces of chicken, watery green beans, mini scoop of Japanese potato salad, broccoli, and hard steamed rice for $6.99. 6 pieces of chicken, a mini egg roll, Japanese sweet egg omelet, daikon salad, and steamed rice for $6.25. Today is April 27th or as I know it... National Prime Rib Day! A couple days later found me on Highway 85 and heading down El Camino Real to Adamsons. It's a small place, limited menu, but I get it. I'm always curious what other people are ordering, but this place has basically two menu items: 1) Prime Rib French Dip 2) Top Sirloin French Dip. Fried Artichokes - Happy Fryday! While the world watches the Royal Wedding today, I'm wondering why they're not serving "Fried Artichokes and Chips" at the reception? LOL! 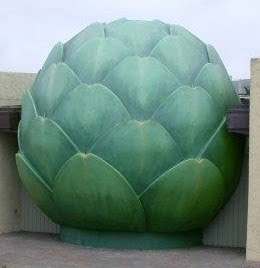 One of my favorite vegetable is the artichoke, had to look it up to be sure it's a vegetable. I like them marinated on an antipasti platter, with pasta, in sandwiches, and on pizza. At the food shows, you'll usually find me sampling all of the the marinated artichokes, including the Roman-Style ones too. Most places don't know what to do with artichokes, except for taking them out of a can. Most people eat artichokes steamed. But for those who've seen the movie "Sideways" and have been to the "Hitching Post II" know about the grilled artichokes served with the smoked tomato mayo. One of the best grilled artichokes I've had. With last week's discussion of ramen with Randy (a friend's client), it got me thinking about one of my favorites...Pho, saimin is the other favorite. I'm not sure exactly why I love pho? I know it has a clean taste compared to ramen and I get to put in all of condiments myself. 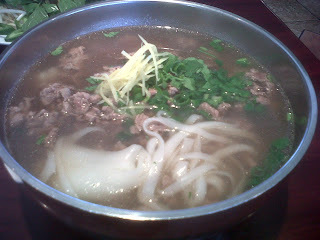 After eating pho, I don't feel sluggish like I do after I eat ramen. Vietnamese food is light and fresh tasting, but I cautious you, it can be very spicy. That's one thing that I like about it, you can adjust it to your taste. The other day I was visiting a friend's restaurant, he asked me for the name of a good ramen place for one of his customers. Before I answered, I asked a few questions. Although my friend didn't know, he called his customer Randy over to my table. I realized that this guy really didn't know too much except for the ramen lists he's seen online and the three main soup bases: Shoyu, Shio, and Miso. I explained that each region in Japan is known for their own style and taste. This opened the door to an hour long discussion of ramen. I don't claim to be an expert, but my friend Keizo is, he runs www.goramen.com. Keizo moved to Japan to learn ramen and has trained at Tokyo's hottest ramen spots. Just following his ramen adventure in Japan makes you want to try the number of places he's been. April 8th is one of my favorite #foodcalendar days, it's National Empanada Day! If you don't know what an empanada is...it's a baked or fried filled pastry found in Latin America and Europe. A wide range of meats, seafood, vegetables, and fruits are used. The great thing is each region makes them different. I've had Brazilian ones with ground shrimp, Venezuelan ones with stewed meat, and Columbian ones with pork and chorizo. Doesn't really matter what type or style you've had, there's nothing that beats a pastry with tasty fillings. Please share what your favorite empanada is and what you think. We're living in a time where the economy doesn't allow for extravagant lunches right now, we're all looking for GOOD lunch bargains. This week, I visited two Japanese places that really have that old skool flavor, taste, and price. Bento Man is a small takeout place with picnic tables. All the food is "a la minute" or cooked to order and that makes it better than those found at the Asian grocery store. It's a bit more American taste, probably why I like it so much, without being too traditional Japanese. It's also a bargain, I've purchased the same fried chicken bento at Mitsuwa for $6.99, not sure how long it had been sitting in the grab & go case. My only concern, with a name like Bento Man, the bento menu is small. Other items on the menu are ramen, udon, curry, and sushi rolls. But the bento is the real deal here.